The average cost of assisted living in Fredericksburg is $3,425 per month. This is higher than the national median of $3,346. Cheaper nearby regions include Kerrville with an average starting cost of $3,175. To help you with your search, browse the 2 reviews below for assisted living facilities in Fredericksburg. On average, consumers rate assisted living in Fredericksburg 4.0 out of 5 stars. Better rated regions include Kerrville with an average rating of 4.4 out of 5 stars. Caring.com has helped thousands of families find high-quality senior care. To speak with one of our Family Advisors about assisted living options and costs in Fredericksburg, call (855) 863-8283. Listed by CBS Miami as one of the Best Vacation Destinations for American History Buffs in February 2018 and named as the Best Small Town by the Southern Living Magazine in March 2018, the city of Fredericksburg, Texas, appeals to seniors seeking a heritage-rich community with a small-town ambiance. Seniors wanting to relocate to Fredericksburg can choose from among four assisted living facilities (ALFs) in the city. ALFs in Fredericksburg and the rest of the state are licensed, certified and monitored by the Texas Health and Human Services Commission. The historic district heart of Fredericksburg is listed in the National Register of Historic Places. Lined with numerous interesting historical landmarks, the district offers seniors a venue for leisurely walks. The National Museum of the Pacific War, one of the city’s main attractions, offers discounted tickets to visitors 65 years old and above and provides free access to wheelchairs and motorized chairs. Seniors in Fredericksburg benefit from Texas’ friendly income tax policy. The state does not deduct taxes from income, including Social Security retirement benefits, private and public pension income and other types of retirement income. The Fredericksburg area is home to world-class medical facilities, including the Hill Country Memorial Hospital, in the event of medical emergencies or illness. Seniors who have little tolerance for harsh winter conditions may find the Fredericksburg climate appealing. The city enjoys mostly sunny days throughout the year. It typically receives no snowfall, and the average low temperature during colder months is more comfortable at 35 degrees compared to the national average of 23 degrees. With its relatively low crime rates, Fredericksburg is one of the safer communities within Texas. It has a property crime rate of 32.3, lower than the state’s 45.5. The violent crime rate is listed at 20, which is also below the state’s 32.9. Although the city’s overall cost of living of 107 is higher than the national average of 100, the health cost of 79 is 21 points lower than the national average. This translates into more affordable healthcare costs for seniors needing long-term maintenance. Assisted Living costs in Fredericksburg start around $3,425 per month on average, while the nationwide average cost of assisted living is $4,000 per month, according to the latest figures from Genworth’s Cost of Care Survey. It’s important to note that assisted living rates in Fredericksburg and the surrounding suburbs can vary widely based on factors such as location, the level of care needed, apartment size and the types of amenities offered at each community. 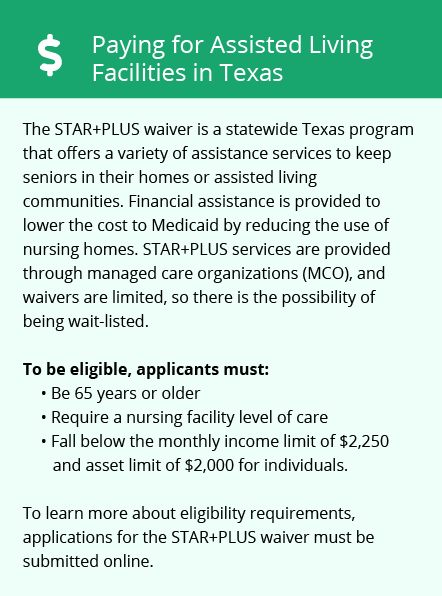 The Texas Health and Human Services Commission offers Medicaid waivers that cover services in ALFs. 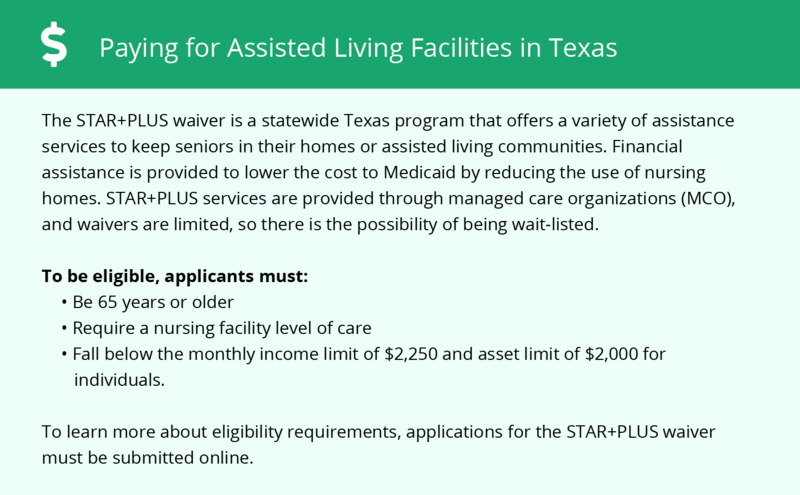 It includes the STAR+PLUS Home and Community-Based Services waiver which offers assisted living services for adults who meet income, resource and medical necessity requirements. In addition, the state also offers the Home and Community-Based Services 1915 (c) waiver for qualified individuals in a small residential setting. Fredericksburg and the surrounding area are home to numerous government agencies and non-profit organizations offering help for seniors searching for or currently residing in an assisted living community. These organizations can also provide assistance in a number of other eldercare services such as geriatric care management, elder law advice, estate planning, finding home care and health and wellness programs. To see a list of free assisted living resources in Fredericksburg, please visit our Assisted Living in Texas page. Fredericksburg-area assisted living communities must adhere to the comprehensive set of state laws and regulations that all assisted living communities in Texas are required to follow. Visit our Assisted Living in Texas page for more information about these laws.